A federal bankruptcy judge has OK'd the sale of the abandoned Spiegel catalog warehouse to a group led by DaHuang Zhou, one half of the world-renowned artists known as the Zhou Brothers. 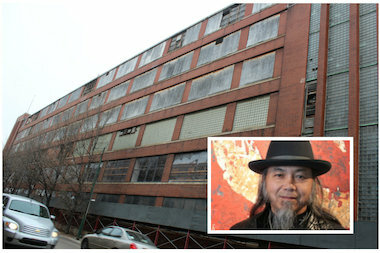 BRIDGEPORT — A federal bankruptcy judge has OK'd the sale of the abandoned Spiegel catalog warehouse to a group led by one half of world-renowned artists known as the Zhou Brothers. Led by DaHuang Zhou, Z. Group International plans to convert the massive six-story building at 1038 W. 35th St. into a mixed-use development. So far, the group has remained tight-lipped about any specifics. "At this point there is a definite mission and plan, but we're not ready to discuss it yet," said Donna Bliss, a spokeswoman for the brothers. The $3.6 million deal could be finalized in about two months, said Ariel Weissberg, attorney for David Dubin, the developer whose Dubin Residential projects in Bridgeport and McKinley Park fell into bankruptcy. Starting in 2006, Dubin had planned to turn the 78-year-old warehouse and office building into "The Lofts at Bridgeport Place," a condo development touting amenities like high ceilings, a parking garage and "state of the art wiring." The project was briefly resurrected as "urban rentals," but that effort also sputtered. The Commission on Chicago Landmarks bestowed the building — part of the mail order company's construction spree in the Central Manufacturing District — with landmark status in 2010. If the sale to Zhou goes through, it would help ease Dubin's substantial bankruptcy debt burden while paving the way for a project that could transform that corner of Bridgeport, part of which will be part of a major renovation project along Morgan Street. "That building is something we've tried to get redeveloped for a long time and it didn't happen. But now it's happening and you've got the Bridgeport Art Center right down the street and the Zhou B Center right there, too," said Ald. James Balcer (11th). "It's been part of the plan that we get these big abandoned buildings filled ... it's slowly coming along but it's getting there." Sheila Messer, a broker with the Bridgeport Realty Group, said a conversion to condos or apartments would provide a near-instant uptick in the amount of available housing in the area. "I think [a sale] would be far better than sitting like it has for years. It's an eyesore, and that area is up-and-coming with the art galleries we have over there. We have a very diverse group of people coming through the area, artists and people from all over," she said. The Zhous arrived in Chicago in 1986 and have reached international acclaim with their paintings, which they work on together in silence. In 2004, the Zhous bought another Spiegel building at 1029 W. 35th St. and converted it into a museum and gallery, which also serves as housing for an artist-in-residence program. Their Zhou B Art Foundation, next to their Morgan Street home and inspirational garden, also hosts artists from across the globe.